Tulips 101: bouquets, indoor care, arrangements + more! If you don’t have a favorite flower yet, I can almost guarantee you’ll fancy the elegant tulip by the end of Tulips 101. 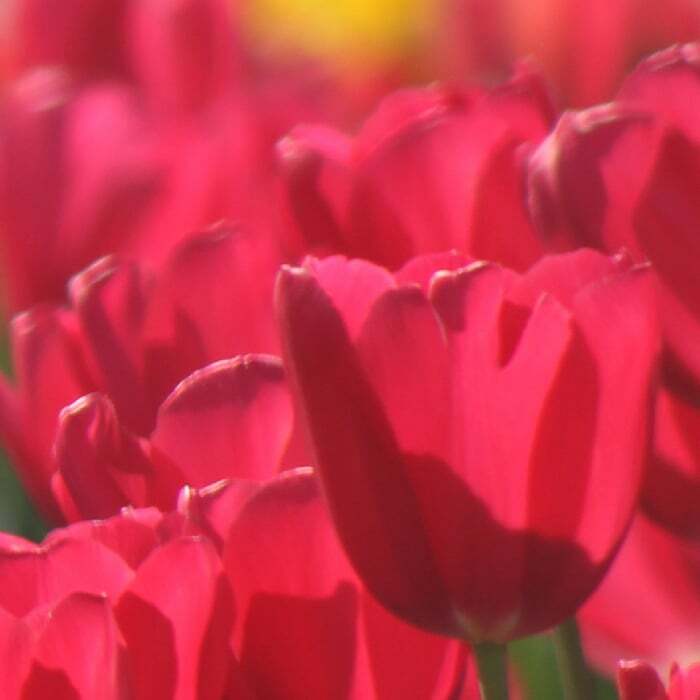 My love for tulips was cemented the moment I opened my silver car door at the Oregon Tulip Festival, dug my feet into the grassy parking lot, and took in the majestic field of candy-colored tulips. The stripes of red, orange, pink, purple, magenta and crisp white took my breath away. But enough about me and my grass stained espadrilles. Tulips 101 is about teaching you how to care for your tulip floral arrangements from bouquet to vase. We’ll take a quick history trip to learn why we’re lucky tulips survived “Tulip Mania” centuries ago. You’ll learn how to care for tulips after they bloom in a vase and how to bloom tulips outdoors to stage a welcoming entrance to your door. If you’re getting hitched, you won’t want to miss the section on incorporating tulips in your big day with tulip-themed wedding centerpiece ideas. And before you go, I’ll give you tips to take Instagram-worthy snapshots of your tulip bouquet. Once just a wildflower growing in Central Asia, the tulip has become one of the most recognizable flowers in the world. When tulips arrived in Vienna in the 16th century, word of their unmistakable beauty spread throughout Europe. During that time (you know, before the interwebs) tulips were auctioned off as commodities. These colorful flowers quickly became popular, leading to one of the first ever market crashes, known as Tulip Mania. A single bulb, from a particularly rare breed, sold for 4200 guilders (over ten times the annual salary of a skilled craftsman of that time). Fortunately, today there are over 3,000 types of tulips around the world. That means plenty of tulips for us to play with in different floral arrangements! Extend the table life of fresh cut tulips by purchasing them while the buds are closed. If you grow and cultivate your own tulips, cut the stems diagonally. Tulips drink a lot of water while in a vase, so ensure your tulips are hydrated with refreshed water daily. Don’t leave the tulips out of water for an extended period of time as dehydration adds to their aging process. Stem leaves that are in the water will rot, so remove them before finishing your tulip arrangements. Your vase should support at least half of the stem, to stop them wilting under the weight of the flower head. Do cut tulips in vases need sunlight? Yes, but don’t let them get too hot! Tulips continue growing up to 1” after cut, towards the sun. They morph from stiff, straight flowers when you purchase them to boisterous floral arrangements blooming with personality and pizazz under the sunlight. Unveil a free and flowy tulip arrangement by rotating the vase each day. Unaware that tulips are free spirits, many people want to learn how to make tulips stand up straight. But I say let them be free as they wind towards the sun. Did you know that tulips love an ice bath? To help them last up to a full week, freshly trim the stems of your tulips while leaving them in the plastic cellophane wrapping. Leave tulips in cellophane overnight in an ice bath, then remove plastic the following morning. If you’re sweating, so are your flowers. While a normal bouquet of tulips will last a week, tulips in the summer without AC won’t stay alive and perky more than a few days. The more you keep them cool by refreshing the ice cold water, the longer they’ll last. You can even place your tulips in the fridge overnight, if you want to extend their lifespan. As mentioned with the ice baths and AC, tulips need a little extra TLC to reach their true blooming potential. You can stick them in the fridge while the buds are closed to help keep them in hibernation mode for a few days before an event. Keep them away from fruits and vegetables, which emit a gas that may harm them. All flowers make amazing Instagram snapshots, if you ask me (or peruse my Instagram account). A tulip arrangement, though, is truly unique because the flowers take up a lot of room while the overall look remains light, casual and airy. I love taking side-shots of tulips with fresh morning sun in the background. The tulips look like they are waking up for the day. When done just right, the light glows through tulip flower petals and reminds me of stained glass. They are stunning and I love the different shapes they take over the course of a week as they bloom. Different types and colors of tulips[/title][fusion_text]Tulips come in a plethora of cheerful colors. So many colors, that you could receive a different bouquet of tulips every week for a year and never get tired of them. (But really, who gets sick of fresh flowers?! Not me!) Even multi color tulip varieties exist. The most popular colors for fresh cut tulips are yellow, red, purple, orange, white and pink. Most red flowers represent love, but in the case of the tulip, other colors have meanings as well. Yellow signifies friendship, white is perfect for a heart-felt apology and pink is joy and happiness (according to our ancestors from the Victorian times). In any color, tulips become even more graceful as they bloom, unveiling beautiful organic shapes, curves and bends in their stems. Weddings with tulips as the focal point can be very romantic and dreamy. Because tulip leaves are wide and strong, many wedding centerpiece ideas include leaves in the design. Tulips are a reasonably priced flower for weddings because you don’t need a lot of them to make an impact. You could purchase tall glass vases to fill with water, fully emerging your tulips, and add a candle on top. If you want more visual ideas, check out my Tulip Wedding Ideas Pinterest board full of tulip themed wedding inspiration from rustic to modern and glam. My favorite ideas to carry a tulip theme throughout your wedding? 1. Stock up on buckets of tulip bulbs for wedding favor gifts and 2. 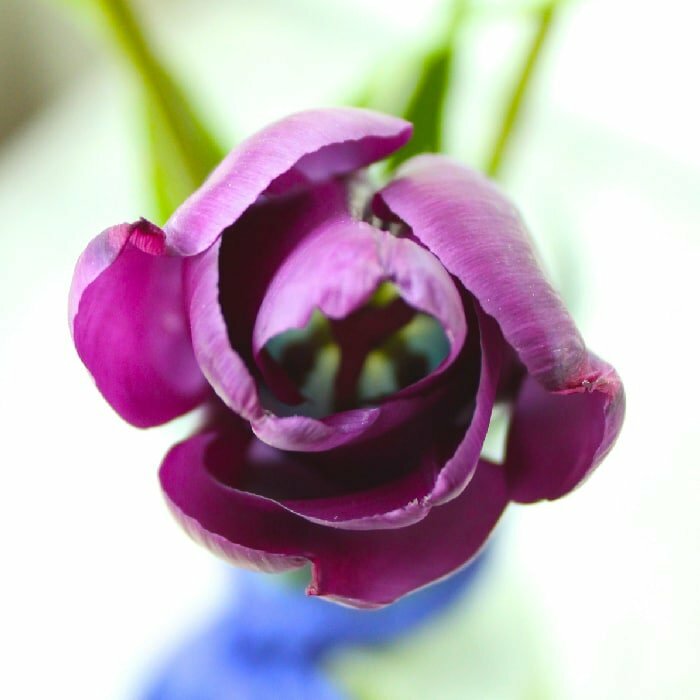 Request tulip boutonnieres for grooms and groomsmen (ask for one tulip bud in your preferred color with a stem of about 2”, accompanied by a green tulip leaf setting and bound together with ribbon for a modern wedding or string for a rustic feel). A versatile flower, you can take care of tulips indoors, outdoors, or in flower pots. If you want to grow tulips in a container outdoors that blooms in time for Easter brunch, you’ll need to determine which months your tulip bulbs need to be planted according to your climate. Planting tulip bulbs in the Fall and Winter is recommended. Tulips in outdoor containers make for beautiful, welcoming entryways and will bloom continuously for 6-8 weeks in the Spring. If you can’t wait to enjoy your blooms, then you can force tulip bulbs to grow. This means simulating winter conditions, by placing them in a refrigerator. They need to be in these cold temperatures for around 10 to 12 weeks. Once a bulb sprouts they are ready for a warmer planting area of around 55F. Within a few weeks you can enjoy the color and fragrance of tulips, through the winter months. As a general guide, the larger the bulb, the larger the flower head. Suggestion for pretty + easy indoor tulip planting: grow tulips in a large, tall vase with rocks in the bottom. Perch tulip bulbs on top, sitting in water and watch them bloom! Tulips are widely available in the Spring and are excellent choices for surprising your loved ones on Mother’s Day, Easter and other celebrations like graduations and anniversaries. Don’t forget to send this guide when your tulip bouquet recipients want to know how to make cut tulips last! Need more tulips in your life? Learn when to plant tulips via the DIY Network. Here’s one of my favorite IG photos of vibrant orange tulips from Oregon. You can follow me @sipbitego on Instagram to catch up on my latest floral obsessions. Make DIY paper flowers (they’ll last longer!) with ideas from my popular floral board. My hand picked tulip board on Pinterest is filled with vibrantly colored tulips. My Weddings with Tulip Themes board has plenty of ideas because I made it for my own personal consideration! Tulips and peonies are my faves!!! I had no idea about the cold water/ice so thanks for sharing that nugget of info! So helpful!! I love tulips! I look forward to spring every year just to see the tulips bloom! They are so gorgeous. Awesome tips!! My heart flutters at the sight of a gorgeously arranged vase of Tulips in bloom. My kids love picking them from our garden every spring. Tulips are so pretty! I can’t wait to plant these in my garden one day! As long as I don’t kill them. I don’t have a green thumb. I too love tulips. The deep purple is probably my favorite color. Thanks for all the great tips! We go to the Wooden Shoe Tulip Festival almost every year – the fields are so beautiful. My favorite flower is a daisy but tulips are very pretty! I actually have my own floral business so I get to work with beautiful flowers a lot! Tulips are definitely some of my very favorite flowers! So they’re beautiful, I love all the colors they’re available in, and they’re different! Your trips are great! Thank you! I love tulips! They are beautiful. It’s amazing how every type of flower has their own set of needs and ways to care for them. I have to say I’m not one for cut flowers, I prefer the real thing blooming outdoors.I love seeing them indoors but get annoyed when they wilt and die. Lovely. I had no idea they like ice! Great tips! Tulips are gorgeous! I didn’t really have any luck with finding the time to plant flowers this year, but I’m hoping I will next year! Oh thanks for this!! I love tulips and plan on purchasing more flowers in the spring. Will incorporate the tips you shared! Oh how I love tulips! They’re one of my favorite flowers. I planted some tulips bulbs last fall and can’t wait for their to bloom this spring. I hope they bloom (lol). I love tulips. They come in such amazing colours and they always look so fresh and bright. They remind me of the Spring and really brighten up a room! I will really love to plant tulip and spices but I seem to have yellow thumb instead of green. Wow, awesome pictures! I can’t wait to go to the Parliament Hill in Canada when we have all the tulips party lol! I love Tulips and we were (my sister and I) just discussing a decoration where we’d use Tulips! I love tulips also and really appreciate the detailed information you have provided here. There are quite a few points I hadn’t considered but you have made me think about here. Also had no idea about using ice – very neat tip. In many ways I think the tulip is under-valued compared to other varieties but they are just as beautiful. I love the bright beautiful colors of tulips. I’ve tried to grow my own. Maybe I’ll try this spring. Am I too late?